These crayons are fun, stackable, and stain free. They are easy for little hands to hold and suitable for children 2 years+. The perfect crayon for your child! PLAYON CRAYON will bring out the joy in drawing for your little one. A beautifully made multifunction desk, and great for small spaces. Desk comes complete with chalk, board wiper, roll of paper, 2 magnets, markers and painting accessories. 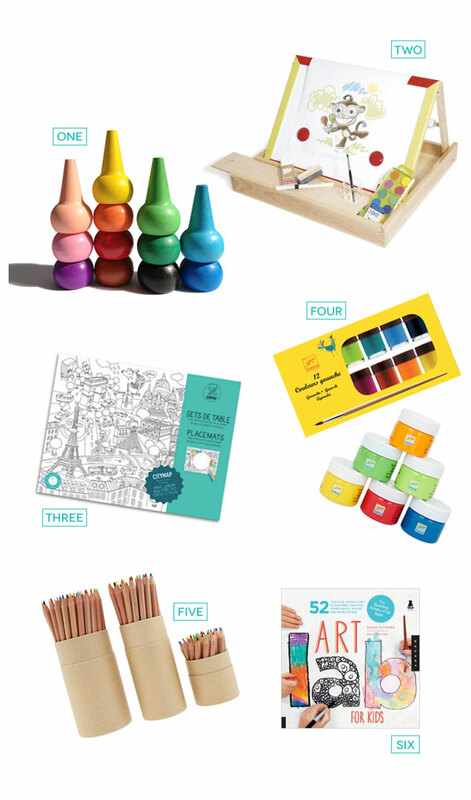 Perfect entertainment and artsy educational fun for kids at the home dinner table or while out to eat. The pretty pouch contains 24 paper placemats to color with 6 different coloring pages: Paris, New -York, London, Tokyo, Rio and a nice map. 6 drawings included, 4 sheets per drawing. Printed on recycled paper. Made of cedarwood and contained in a handy card cylinder. Available in tubs of 36 and 60 colours. A refreshing source of ideas for creating fine art with children, Art Lab for Kids encourages the artist’s own voice, marks, and style. This fun and creative book features 52 fine art projects set into weekly lessons, beginning with drawing, moving through painting and printmaking, and then building to paper collage and mixed media. Art Lab for Kids is the perfect book for creative families, friends, and community groups and works as lesson plans for both experienced and new art teachers. Children of all ages and experience levels can be guided by adults and will enjoy these engaging exercises.